Item #BE-1: One dozen pairs of approximately 5.5" tall, various styles and colors Mexican Onyx Floral Bookends; Actual shipping charges apply. Item #BE-1: Approximately 5.5" tall, Various styles and colors Mexican Onyx Floral Bookends. Item #BE-14A: One pair of 5.5" tall, assorted natural colors Mexican Onyx Owl Bookends. Item #BE-6: One dozen pairs of 6" tall, assorted natural colors Mexican Onyx Tiki Doll Bookends; Actual shipping charges apply. 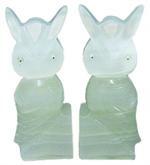 Item #BE-6: One pair of 6" tall, assorted natural colors Mexican Onyx Tiki Doll Bookends.